Free player on select models! Our vintage grand pianos sound like new. 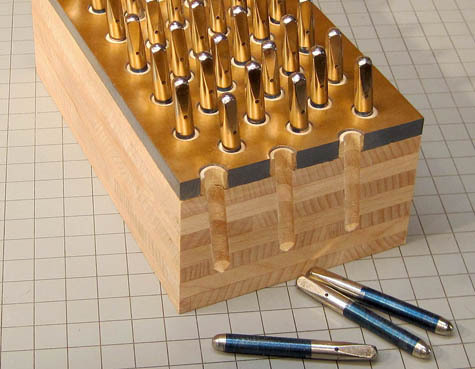 Each piano is rebuilt with new strings and pin block to hold a perfect tune. These heirloom pianos produce thick sound and rich brilliant tone, with excellent action and playability, because of the extremely high quality materials and craftsmanship of the time period. Our pianos are not only functionally restored, the wood cases are completely refinished to look like new. Listen to Bill Davidow, the owner of Grand Piano Showcase play a rebuilt baby grand piano. Grand Piano Showcase sells only heirloom quality rebuilt and refinished grand pianos. Heirloom grand pianos are expertly crafted 1900s American and German pianos, from the golden age of piano building, using a quality of materials that is no longer available. Unlike cheaper Japanese and Korean pianos which become disposable when it comes time to rebuild, heirloom pianos actually increase in value over time. Our pianos are an investment that can be passed down from generation to generation, and you do not have to pay the price of a new Steinway piano. Click play below to hear Piano Buyer's Education audio. Grand Piano Showcase features the largest selection of rare Louis XV curved leg baby grand pianos with hand-carved scalloping in many different wood finishes. 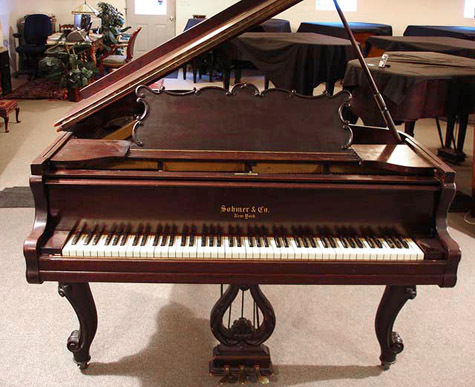 We have several ornate round leg Victorian and Florentine pianos available. We have unique Spanish and double leg baby grand pianos that are hard to find. We also always keep a good selection of gloss black and square leg heirloom pianos in stock. on other areas of our site. If you are not a piano player or like would like to provide live piano music for guests without playing, we offer grand piano self player iPhone systems so your piano plays itself. They are easy to use, integrate with the latest phones and tablets, and add another level of entertainment that your piano can provide. Many people are new to the piano buying market. There are several different options to consider, new or used, rebuilt or not, Asian or American. We cover the pros and cons in our used baby grand piano education section. We have found that rebuilt and refinished heirloom quality pianos are the only option that offers investment and musician quality at an affordable price. 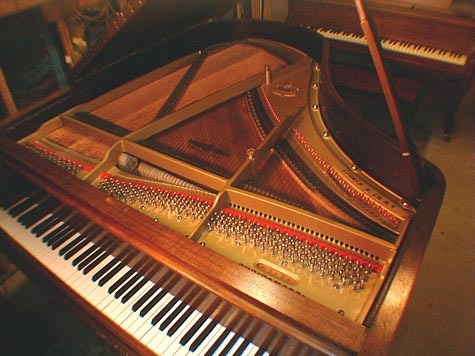 See more used baby grand piano buyers information here, where we explain why we have chosen to only sell vintage heirloom quality rebuilt pianos. In our 30+ years, we often hear the same questions asked about brands, sizes, and piano preferences. 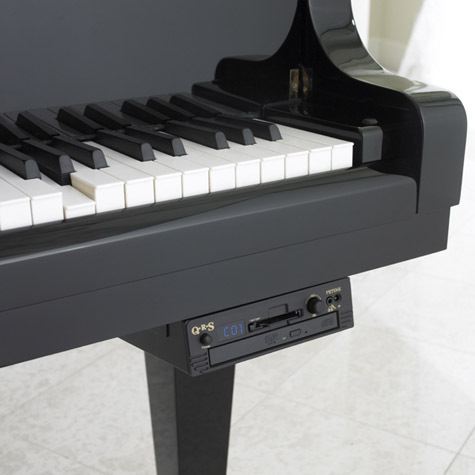 We address them in our FAQ: grand piano questions & answers. And we also have special grand piano advice for parents. Many parents wonder about what age to start lessons, where to find teachers, and what pianos are good choices for a child that is learning. There is not a piano job that we cannot tackle, including dropping a piano into the upper floor of a house under construction with a crane. Our typical used baby grand piano services are not usually so extreme. We restore and refinish our pianos, but we can also provide used grand piano restorations, servicing & refinishing for your used piano. If you would like an expert report of what your piano is worth we provide grand piano appraisals, but only in the Atlanta area. We cannot provide appraisals over the phone or internet. If your piano is in good condition to sell, we can do grand piano consignment and sell it for you. We can also buy a piano that needs restoration, if you would like to sell your baby grand piano. We offer cash and purchase at wholesale prices. If you purchase a piano we offer free nationwide shipping, but we also do grand piano shipping for anyone that needs to move their piano. If you would like to meet Bill Davidow the owner, and find out more at our about grand piano showcase page. We ensure the quality of our pianos with our used baby grand piano guarantee, a written 10 year limited piano warranty and lifetime trade-up policy. 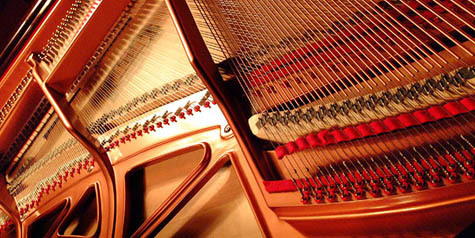 We are happy to provide grand piano references upon request. Our grand pianos accepted payments are accept cash, wire transfers, and personal checks; and we offer expert piano financing through Allegro Acceptance. Please contact grand piano showcase if you have an questions or concerns. Bill Davidow would be happy to speak with you or email with any information you need.